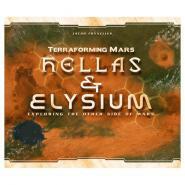 Terraforming Mars: Hellas & Elysium, the first expansion for Terraforming Mars, consists of a double-sided game board presenting two new areas of Mars. Each of these maps consists of new sets of milestones and awards with relevance for that particular map. Place three tiles around the south pole to be a Polar Explorer, for example, or race to have the most estates beside water on Elysium! Send your trade fleet to distant moons! Colonize the clouds of Jupiter! And let your Earth assets propel you to success!